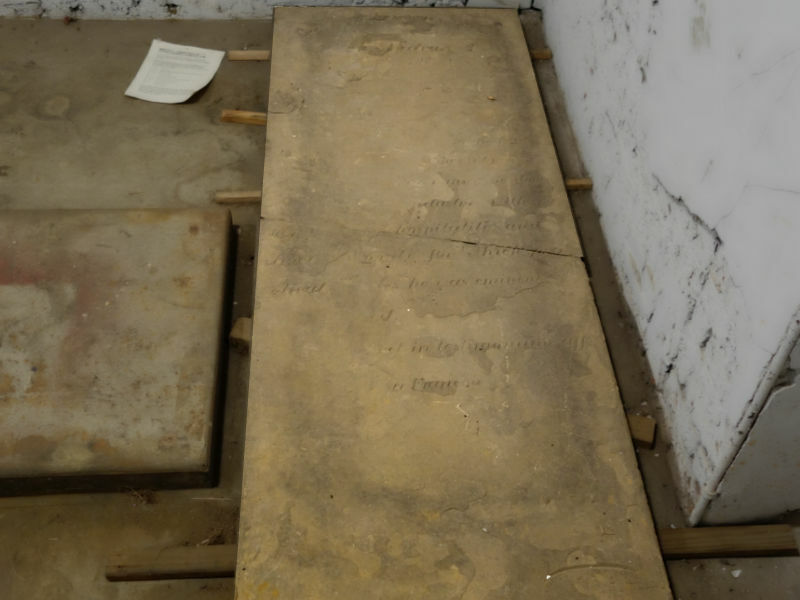 Who is this Peter Audrain, whose tombstone resides within a lonely storage room in Historic Fort Wayne's interior? Why is his grave marker here? This stone raises more questions than answers, but that's half the fun for history lovers like us, right? Pierre (Peter) Audrain was born in France in 1725 and came to Pennsylvania in 1777 during the American Revolution. Married to an English woman, eventual father of nine, he became an American citizen in 1781. He served as secretary for a French diplomat, hired because he was fluent in the English language. There is evidence that in his spare time he would join his friends in privateering, harassing the British on the seas, and may have even been recruited in France for this purpose. He relocated to Detroit in 1796, where he was made Wayne County's notary by his travel companion - none other than General Anthony Wayne, the county's and Fort Wayne's namesake. For many years following, he would serve as probate judge, City Registrar, Clerk of Courts, Secretary to the Land Board, and various other state and municipal positions. 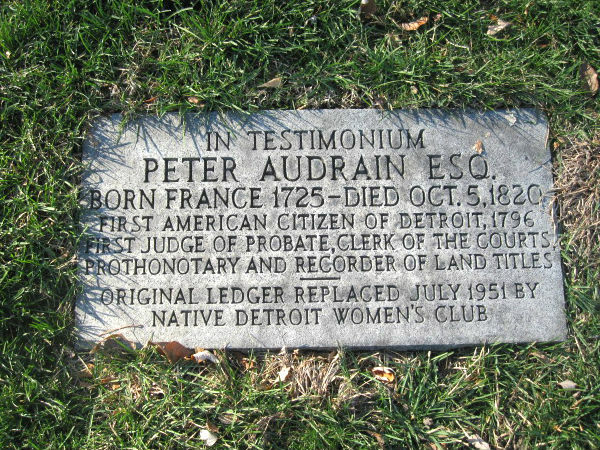 Evidently, as Detroit's first City Registrar upon the peaceful withdrawal of Detroit's British occupiers, Audrain had the unique honor of designating himself the "First American citizen of Detroit, 1796." This dubious title resides on his replacement tombstone found in Detroit's Mount Elliott Cemetery (see image). The stone was laid by the Native Detroit Women's Club in 1951. It is headed, "In Testimonium," so it's not clear that his remains are there with it. Though he may be all but forgotten now, his name once adorned a Detroit street for many years. The street previously named Audrain was changed to Clayton Street around the year 1920. It's just two miles from the fort, straight up Livernois Ave. Note that Audrain was certainly not a young lad when he arrived in Detroit. He was 71 years old, a very ripe old age in those days and yet, he was entrusted with many ranks of authority throughout his golden years thereafter. This was a man with a sharp mind and an eloquent pen, said to be distinguished by his "assiduous accuracy and punctuality." According to Story of Detroit by George B. Catlin, just before the onset of the War of 1812, Audrain "subscribed 8 shillings, acting with other Detroit residents to buy powder 'in case of emergency.' The emergency occurred, and Detroit was recaptured by the British. Peter Audrain’s house was 'plundered of everything valuable and he and his family moved to the McCarty farm a mile below the city until the war’s close.' He was a prisoner of war, but permitted to be at home mostly, on parole. In 1813 he is named as one among the group of Americans who went to save prisoners of the River Raisin Battle" which occurred 30 miles downriver. He was 88 years old at the time! Another text, Michigan Pioneer and Historical Society Vol XXVI notes, "In that critical period residing right at the frontier of intolerant and arrogant Britishers, he was a fearless patriot, always on the alert to bring any disloyal subjects and to notify officials of suspicious conduct of would-be American citizens. He was only removed from these offices when he became too old to perform the duties required of him in 1819. He was 94 years old at this time. He died 6 Oct 1820. The 'finely sculptured stone covering the grave of Audrain' is mentioned among the ashes and tombs of generations of the French race, including some reinterred from Ste Anne, north of Jefferson Avenue 200 feet west of Griswold." Per Western Pennsylvania Historical Magazine Vol 21, "In Detroit, he was shown as a member of St. Anne Catholic Church. His Tomb stone was in the cemetery of that congregation." 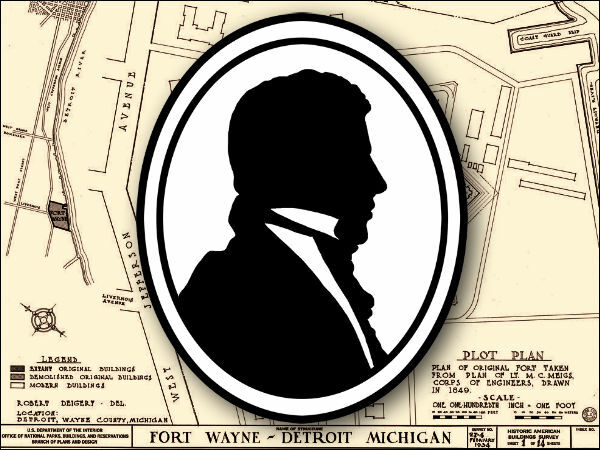 James Conway, Historian and Project Manager for Historic Fort Wayne notes the following: "We do not know how and when his tombstone was brought to Historic Fort Wayne, probably during the Detroit Historical Museum era after 1949." Will it remain a mystery forever? His grave stone waits patiently at our beloved fort for the next up and coming historian to uncover the true reason it's here. Could it be you?